Gaidheil aig Oilthigh Ghlaschu anns an t-seachdamh linn deug. Bha Gaidheil bitheanta aig Oilthigh Ghlaschu fad na seachdamh linn deug. B’e uaislean a’ chinnidh agus oileanaich a bh’ air am maoineachadh leis an eaglais an dà bhuidheann bu lìonmhoir agus as follaisich anns na clàraidhean bhon a’ Ghaidhealtachd. Deas, Tùr Dhùin Olaidh. Chaidh thogail le ceannardan Chloinn Dhùghaill, 15mh linn agus bha iad a’ còmhnaidh ann gu ruige 1746 (dealbh, A. MacCoinnich). A thaobh na h-uaislean, bha teaghlach MhicDhùghaill Dhùin Olaidh air aona dhiubh sin. Bha an teaghlach seo a’ cumail taic ri sgrìobhaichean Gàidhlig. Tha dlighe sgrìobhte ann an Gàidhlig, 1603×1616, an co-cheangal ri Donnchadh MacDhùghaill, rud nach eil na annas ann an sgìre Latharna aig an t-àm sin. Chaochail Donnchadh ann an 1616, agus rinn an lighiche Gaidhealach, Donnchadh Ó Conchubair, luaidh air. B’ e Sir Iain MacDhùghaill a lean e mar cheannard ann an 1616. Tha iomradh air ‘Joannes mcDowgall,’ is math dh’ fhaoidte an aona dhuine, a’ frithealadh chlasaichean aig Oilthigh Ghlaschu ann an 1598. Chuir Sir Iain MacDhùghaill, fear Dhùin Olaidh, a cheathrar mhic, Alasdair, Uisdean, Dùghall agus Donnchadh, dhan sgoil a Ghlaschu ann an 1627. Bha iad a’ fuireach còmhla ri Uilleam Neilson, bùirdeasach sa bhaile. Is e an aona adhbhar gu bheil lorg againn air an eachdraidh seo gun thog Neilson gearain an aghaidh MacDhùghaill leis nach do phàigh e cosgaisean a mhic! Feumaidh gun deach a’ cheist a shocrachadh oir chan eilear a’ cluinntinn a’ chòrr mu dheidhinn. 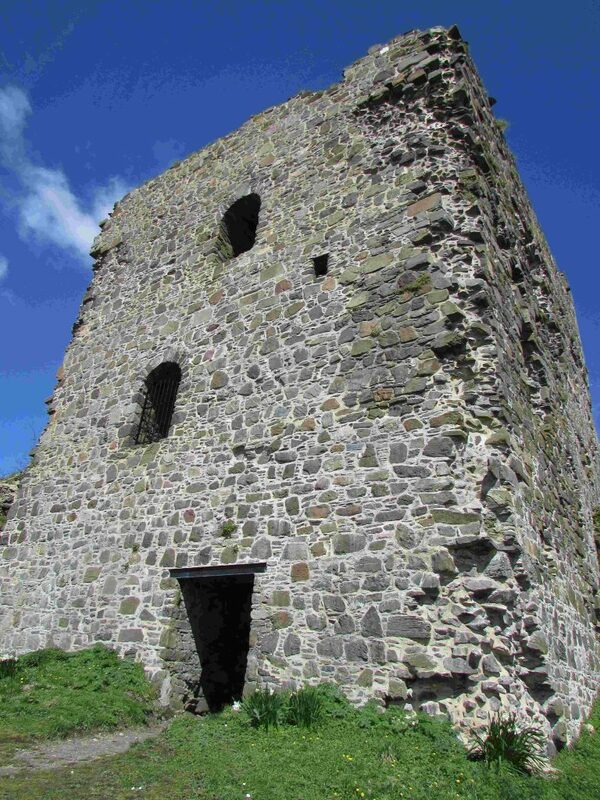 Tha lorg air Alasdair MacDhùghaill mar oileanach aig Oilthigh Ghlaschu ann an 1629-30. Tha an dealbh dhan seo, a leanas, NLS, Adv MS 72.1.9, fol. 1r., air a chleachdadh le cead o Leabharlann Nàiseanta na h-Alba. Chithear sloinntearachd Alasdair Mòr MhicDhubhghaill ann an seo (gu h-àrd), a bha beò am meadhan an 17mh linn, ga chuir air ais gun chiad Dùbhhall on tug an teaghlach seo an t-sloinnidh. Is e Somhairle, an curaidh ainmeil (chaochail 1164), agus athair, Gillebrìde, a th’ aig ceann an liosta. 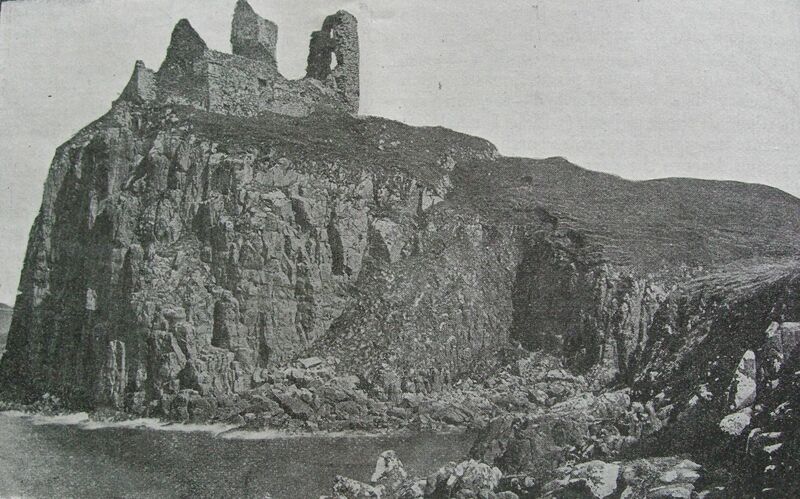 Caisteal Dhùin Tuilm, Tròndairnis: aon de sheann dhaingneachdan Dòmhnallaich Shlèite (dealbh air a thogail on Celtic Monthly, 9 (1901), 6). Bha Sir Ruairidh Mòr MacLeòid (chaochail 1626) air a bhith a’ sabaid ann an cogaidhean na h-Èirinn anns na 1590an agus bha e buailteach air a bhith a’ sgrìobhadh ainm ann an làmh Ghaidhealach le corra-litir. Bhiodh bàird ga mholadh agus bha grunnan de sgrìobhaichean aige a bha a’ cumail cunntasan laitheil ann an Gàidhlig anns a’ chiad chairteal dhan t-seachdamh linn deug. Chan eil fhios cà’n deach Ruairidh oideachadh ach bha na mic aige, agus cuid eile de Shìol Tormoid, a’ frithealach sgoiltean agus Oilthigh Ghlaschu anns na 1620an agus rè na seachdamh linn deug. Dealbh an seo de Chaisteal Dhùin Bheagain, prìomh aitreabh Shìol Tormoid no Clann MhicLeòid Dhùin Bheagain agus na Hearadh. Ìomhaigh air thogail bhon iris, Celtic Monthly XI (1903), 145. Bha ceanglaichean malairt làidir eadar Leòdaich an t-Eilean Sgitheanach agus marsantan Ghlaschu mun t-àm seo. Chuir Ruairidh Mòr MacLeòid a mhic, Iain Mòr, Uilleam agus Tormod dhan Oilthigh. Bha iad a’ fuireach còmhla ri bùirdeasaich anns a’ bhaile fhads a bha iad a’ frithealadh an Oilthighe. 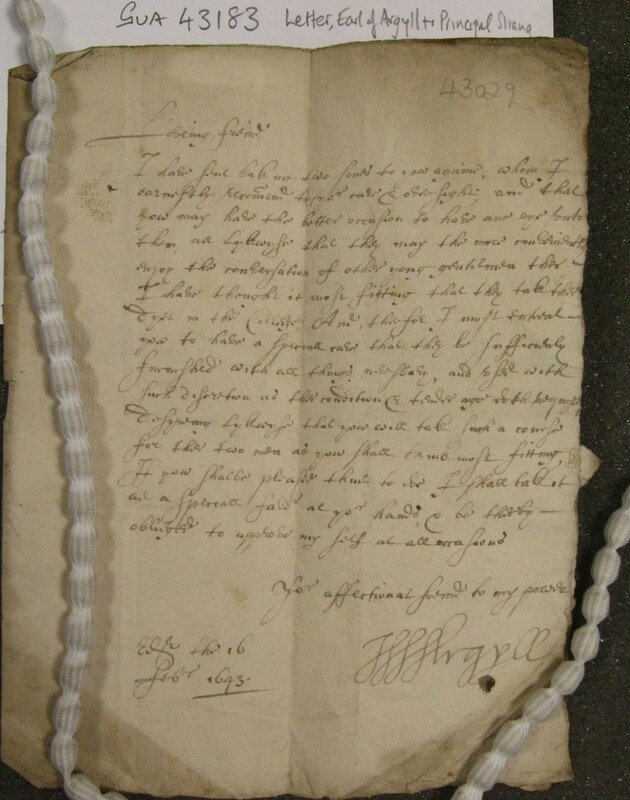 Thug Iain Mòr MacLeòid, a lean athair mar cheann-fheadhna Chlann MhicLeòid ann an 1626, taic-airgid de £100 do dh’ Oilthigh Ghlaschu ann an 1630 gus an cuideachadh ann a bhith a’ togail Colaiste agus leabharlann ùr. Sgrìobh Iain Mòr ‘Joannes MacClaud a Hereis’ (1624) agus a bhràthair, Tormod, ‘Normandus McClaud’ (1630) an ainmean len làmh fhèin ann an clàraidhean an Oilthigh. Na dealbhan seo air an cleachdadh le cead o sheirbhisean tasg-lann Oilthigh Ghlaschu, GB0248 GUA 26619. Bha Caimbeulaich pailt aig Oilthigh Ghlaschu riamh bhon chaidh a stèidheachadh ann an 1451. Lean an cleachdadh sin sìos na linntean. B’ ann do dh’ Oilthigh Chill-rìmhinn a chaidh Gilleasbuig Caimbeul, Triath Lathurna (8mh Iarla Earraghaidheal an deidh 1641), eadar 1621 agus 1623. 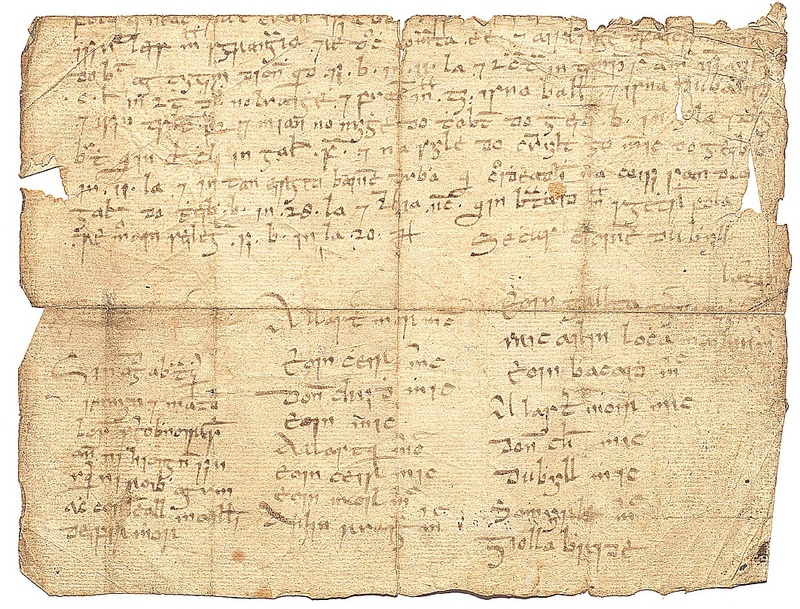 Dealbh, clì, de Ghilleasbuig Caimbeul, an Triath Lathurna, aithnichte cuideachd mar an 8mh Iarla agus Marcus Earraghaidheal, 1598-1661. An dealbh seo dheth le David Scougall air a chleachdadh le cead o Thaigh Tasgaidh Nàiseanta nan Dealbh, Dùn Èideann. ©Scottish National Portrait Gallery, PG 1408. ©University of Glasgow Archive Services, GB0248, GUA 43183. An dealbh seo air fhoillseachadh le cead bho thasglann Oilthigh Ghlaschu. Aineam nam bràithrean mar a chaidh an sgrìobhadh ann an leabhraichean- clàraidh an Oilthigh, 1642-43. Chithear cuideachd ainm cheann-feadhna Ghaidhleach eile, ri taobh ainm Ghilleasbuig Chaimbeul: Iain Mac a’ Chombaich, fear Luis. Na dealbhan seo air an cleachdadh le cead o Thasg-lann Oilthigh Ghlaschu, GB 0248, GUA GUA 26619/204 & 310. B’ e MacCailean Mòr a chanas daoine ri gach ceannard nan Caimbeulach mar chuimhneachan air aon de thùsanaich an t-sliochd aca. B’e Gilleasbuig Gruamach a bh’ aig daoine air Gilleasbuig, 7mh Iarla Earraghaidheal (riaghladh, 1594-1618) – ach is dòcha air a mhac, am Marcas, cuideachd. A-rèir Cholm Ó Baoill, b’e Gilleasbaig Caoch am far-ainm a bh’ air an 8mh Iarla & Marcas Earraghaidheail (riaghladh 1625-1661), agus Gilleasbaig Fionn air a mhac, an 9mh Iarla (1661-1685). [ 13 ] Tha na far-ainmean sin na chomharra orra mar Ghaidheil. 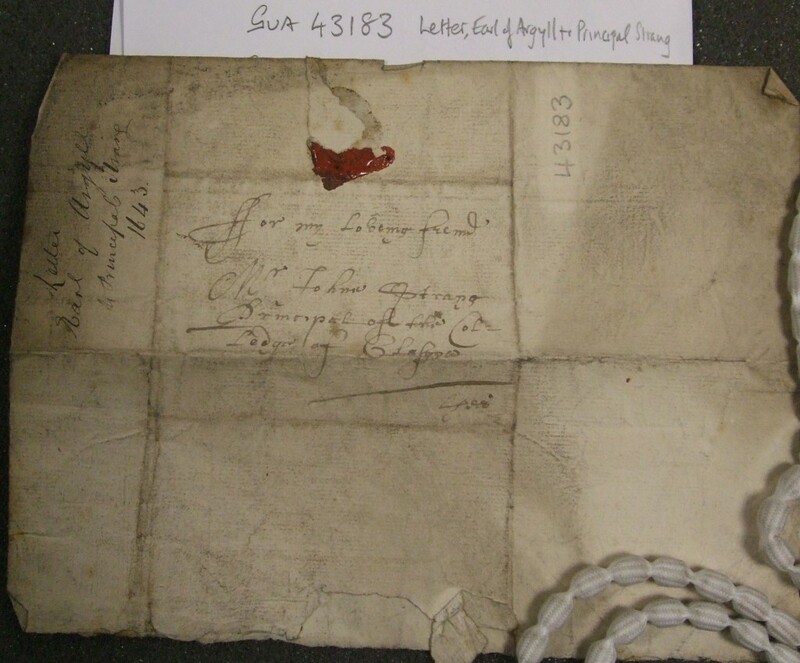 [ 1 ] Inveraray Castle Archive [ICA], Argyll Transcripts [AT], xi, 73. C. Innes, ed., Muminentae Alme Universitatis Glasguensis [MAUG] (4 vols., Maitland Club, Glasgow, 1854), iii, 63, 81. R. I. Black, ‘A Gaelic contract of lease, c. 1603 x 1616,’ ann an, D. Sellar, ed., The Stair Society. Miscellany Two. By various authors (Stair Society, Edinburgh, 1984), 132-143, aig 140. R. Black, The Gaelic Manuscripts of Scotland. Vol. 1., Classical Gaelic, Irish and Welsh manuscripts in the National Library of Scotland (Unpublished draft catalogue), air a leughadh ann an Leabharlann Nàiseanta na h-Alba, Dùn Èideann. Le taing cuideachd don Oll. Ulrike Hogg, Leabharlann Nàiseanta na h-Alba airson cuideachadh le cead gus an dealbh seo chuir air-loidhne. [ 2 ] National Records of Scotland [NRS], RD 1/305, fol. 108v. Tha lorg air Niall mar ‘Nigellus McKinnone,’ a’ frithealadh an oilthigh ann an 1620. MAUG, iii, 74. A. Nicolson, The History of Skye (2nd edition, Àrd Bhearnasdal, 1995), 80-81. [ 3 ] A. Nicolson, The History of Skye, 94. A. I. Mackenzie, ed., Òrain Iain Luim. Songs of John Macdonald bard of Keppoch (SGTS, Edinburgh, 1964), 102-106, 136-140, 277-9, 289-291. Thug grunnan chinn-fheadhna agus pearsachan clèir o gach ceàrnaidh den dùthaich airgead do dh’ Oilthigh Ghlaschu anns na 1630an agus bha Gaidheal nam measg. Bha Iain Macleòid, fear Dhùin Bheagain air aona dhiubh (gu h-h-ìosal), agus chithear cuideachd na h-ainmean a leanas air an liosta: Eachann MacGhill’Eain, fear òga Dhubh-aird, lean, Sir Coll MacLaomuinn, fear ‘Innerin’, Seumas MacLaomuinn, Sir Dùbhghall Caimbeul, fear Acha nam Breac, Seòras MacCoinnich, Triath Chinntàil is Iarla Sìophoirt, Iain Leslie, Easbuig nan Eilean (1631) agus an Easbuig a lean e anns an dreuchd sin, an t-Easbuig Niall Caimbeul, Mgr Gilleasbuig MacLachlainn, ministeir Luis, Mgr Gilleasbuig Cameron, ministeir Innis Cailleach. MAUG, iii, 465-480. [ 4 ] J. Bannerman, ‘Gaelic endorsements of early seventeenth century legal documents’, ann an Studia Celtica, xiv/xv (1979-80), 18-33. [ 6 ] Thuirt Alasdair MacNeacail gur e suim de 100 merk a bha seo (mu £66) ach tha bann-cuidhteas, 16mh dhan Iuchar 1632 ag radha gun tug Iain MacLeòid £100 do riochdairean Colaiste Ghlaschu. Nicolson, The History of Skye, 75. 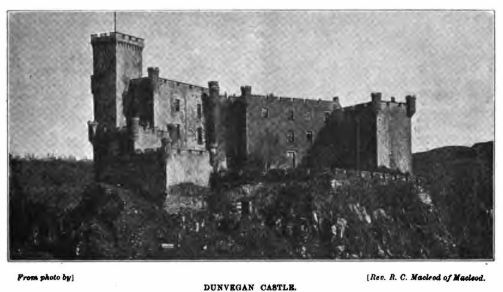 Macleod, ed., The Book of Dunvegan, i, 224. [ 7 ] J.C. Watson, ed., Gaelic Songs of Mary Macleod (SGTS, Edinburgh, 1934). A. Frater, ‘Màiri Nighean Alasdair Ruaidh’, in J. Randall, ed., Crossing the Minch. Exploring the Links between Skye and the Outer Hebrides (Islands Book Trust, 2008), 33-43. P. Parkes, ‘Celtic fosterage: adoptive kinship and clientage in north west Europe’, Comparative Studies in Society and History, 48/2 (2006), 359-95, aig 385-7. [ 8 ] MAUG, iii, 18. ICA, AT, xi, 639. [ 10 ] A. I. Macinnes, The British Confederate. Archibald Campbell, Marquess of Argyll, 1607-1661 (Edinburgh, 2011), 1-43. [ 11 ] GUAS, GUA 43183. MAUG, iii, ix-x, xiv, 97, 101. Macinnes, The British Confederate, 66-67. D. Gregory , ed., Collectanea de Rebus Albanacis (Iona Club, Edinburgh, 1847), 19-20. C. Innes, ed., The Black Book of Taymouth, with other papers from the Breadalbane charter room (Bannatyne Club, Edinburgh, 1855), xvii-xxiii, 94. R. Black, ‘A Scottish grammatical tract, c. 1640,’ in, P. de Brún & M. Ó Murchú, eds., Celtica, vol. XXI. Essays in honour of Brian Ó Cuív (1990), 3- 16, aig 6-7. [ 12 ] Macinnes, The British Confederate, 277-280, 283, 294-306. 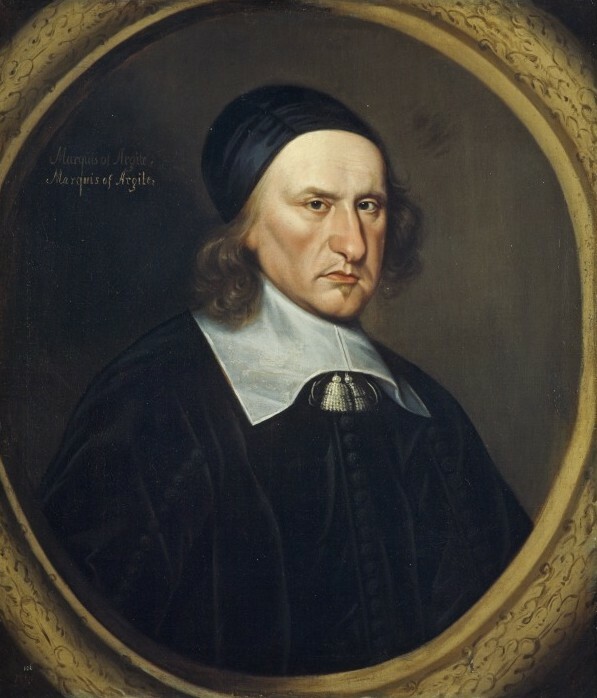 David Stevenson, ‘Campbell, Archibald, marquess of Argyll (1605×7–1661)’ & ‘Campbell, Archibald, ninth earl of Argyll (1629–1685)’, anns an Oxford Dictionary of National Biography, articles 4472 & 4473, accessed Dec 2013]. [ 13 ] C. Ó Baoill & M. Bateman, ed. & transl., Gàir nan Clàrsach. The Harps’ Cry. An Anthology of 17th century Gaelic poetry (Birlinn, Edinburgh, 1994), 10, 14, 16. Macinnes, The British Confederate, 31.